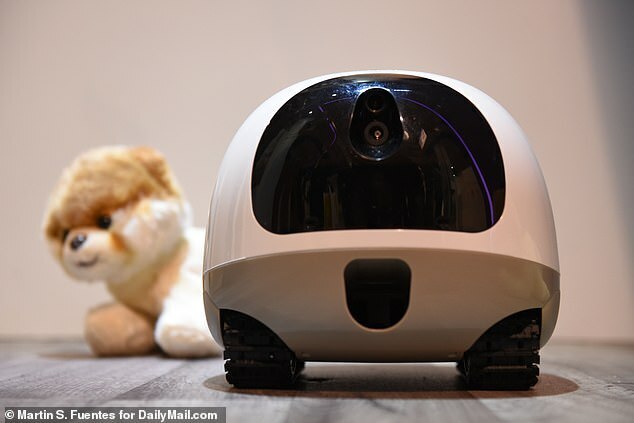 Vava has unveiled a new pet camera that will let you follow your dog or cat around the house when you’re not home. The device, said to be the first mobile pet cam in the world, made its debut at CES in Las Vegas this week. 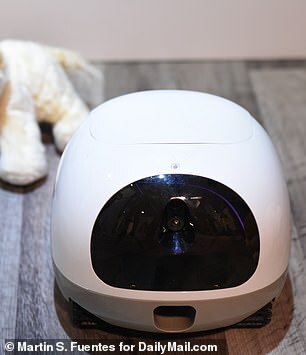 Vava’s Pet Cam is equipped with two-way audio so you can hear and speak to your pet remotely, and collision detection will let it roam the house without bumping into anything or falling down the stairs. The Vava Pet Cam connects with an app that lets you interact with your pets from afar. The device will begin shipping this year for $299. Vava launched its latest device on Indiegogo at the end of last year for $159. It will retail at $299 when it’s officially released next month. Pet Cam has a 120-degree wide-angle lens, letting it see broad areas when looking in any particular direction. It pairs up with an app, which you can use to control its motion and follow your pet around, take photos, or dispense treats, Kim Tran of Vava told Dailymail.com at CES. The system provides real-time smart bark alerts to let you know if something might be going on, and it’s got a built-in laser pointer and feather teaser to entertain pets. Bark alerts can also be turned off for pet owners whose dogs are known to bark all day. Pet Cam uses a rechargeable battery that lasts about a week on a single charge, Tran says. If it’s actively streaming or playing, it will last 8 hours. 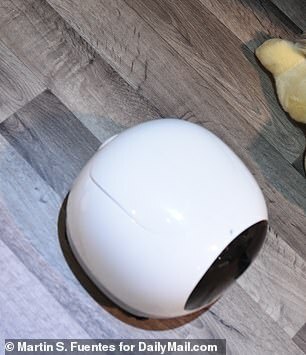 Much like a Roomba or other robotic devices that navigate the house autonomously, Pet Cam has built-in sensors that prevent it from crashing into household objects (or your pets), or falling down stairs. Unlike static pet cameras, Vava’s new device lets you check up on your pets as they move about the house. The device lets you ‘see, play, treat and talk to your pets no matter where they are, even if they’re under the bed,’ Vava says. The firm says it will begin shipping late this year.